Your emergency contact and medical information with you at all times. 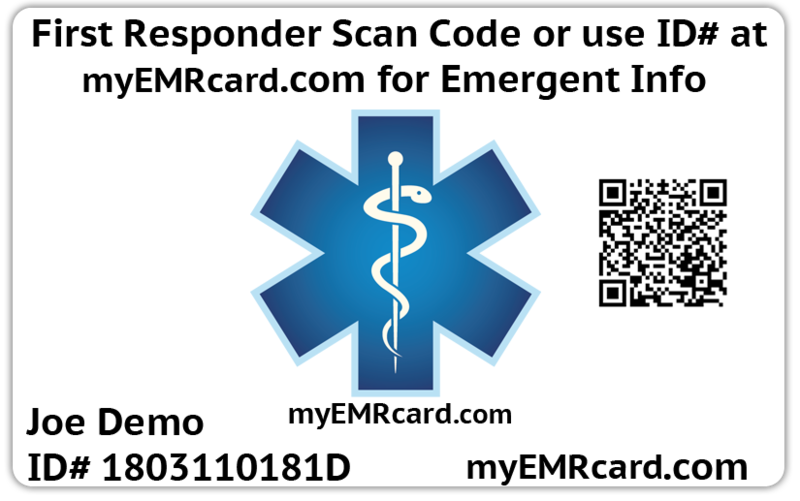 myEMRcard.com provides emergency personnel with your information using a reliable web interface paired with a scannable QR code on a wallet card. Whether you need someone to call your attorney, caregiver, family out of state or your spouse across town, myEMRcard™ has you covered. myEMRcard™ is your secure online personal information portal that allows you to provide first responders, medical personnel, and others quick, easy access to information about your medical history, emergency contacts, and personal wishes when you are critically ill, in an accident, or incapacitated for any reason. Make an account for everyone in your family--children, elderly parents or grandparents, or anyone with a serious medical condition. myEMRcard™ even lets you include information about your pets! At only $39.99 per year, myEMRcard.com allows you to access the emergency information you need, when you need it, for only pennies per day. It’s simple: Get started quickly and share your emergency contact and medical information in minutes. - Anyone who wants the convenience of having access to critical information at all times.